Here are some aerial views and detailed descriptions of what you can see, most have been taken from top floors of open multi storey car parks in Bolton, others from high vantage points surrounding the town. A separate page has views from the top of St. Peter's church. A set of views taken from the air by Johnathan Webb are also available. On the middle horizon is the tower from St Peter's in Churchgate, in the foreground is the River Croal, which runs underneath most of Bolton. 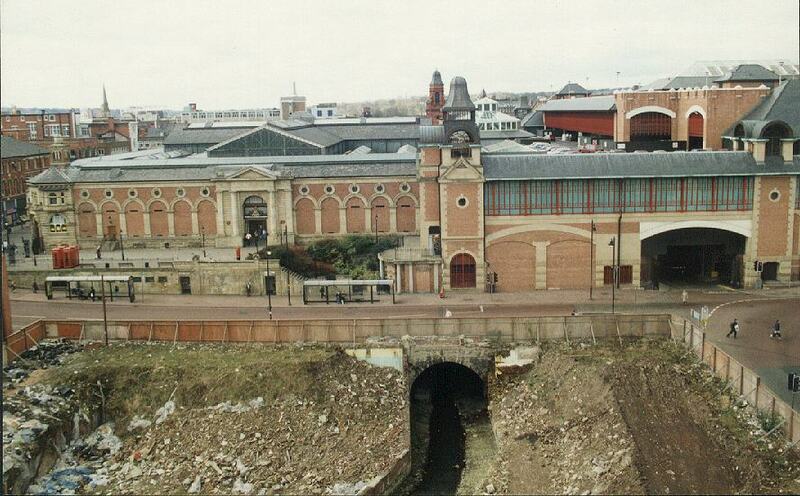 This part of the river was uncovered when the old "Co-Op" supermarket was demolished, but is seen disappearing underneath a multi storey car park. The frontage of the demolished building has been retained (left) supported by scaffolding for historical reasons. 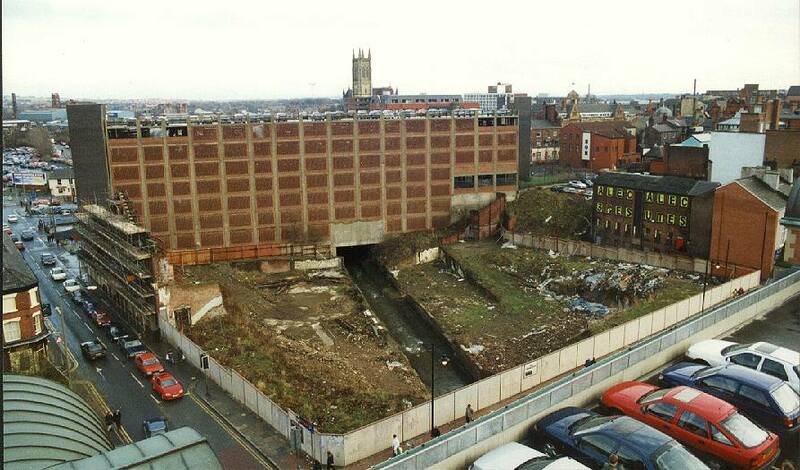 Update February 1997: The frontage has been removed, brick by brick when it became unsafe. The site has now been acquired and the open river is now being covered over prior to building work commencing. 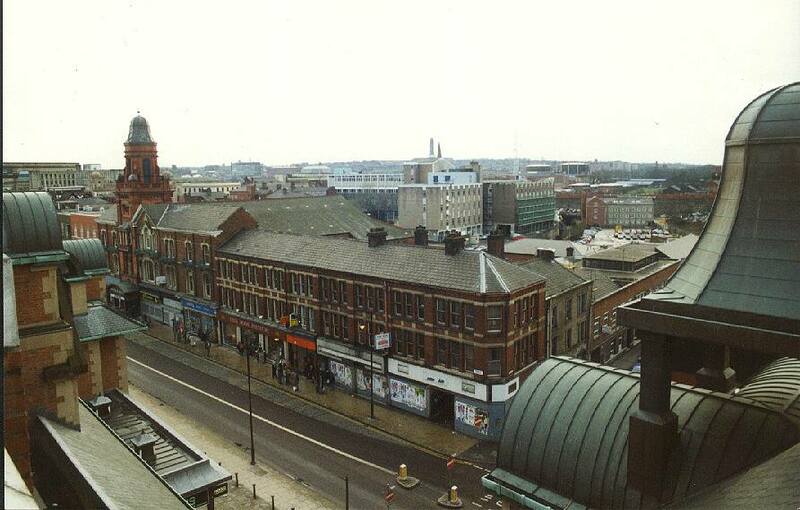 Victoria Hall and its tower on the left, and shop fronts from the northern end of Knowsley Street. 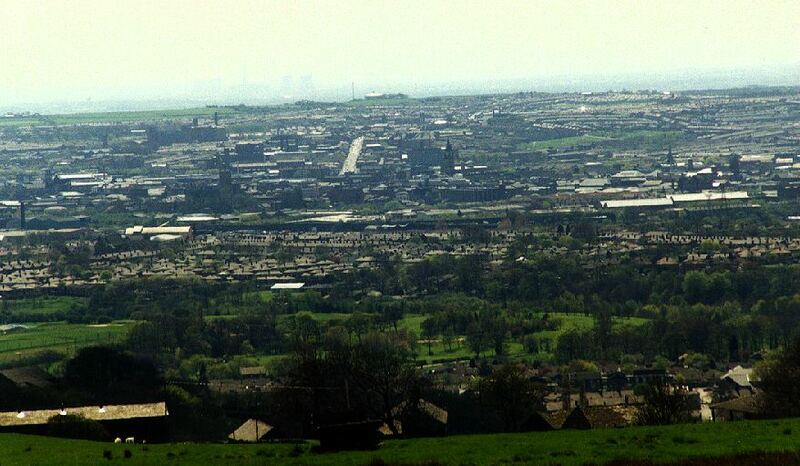 The rising skyline middle right is known as Daubhill (pronounced "dobb-ull") a residential suburb. This church was originally built for the user of Little Bolton parishioners, but was no longer needed when Little Bolton merged with Great Bolton in 1838. It is now used to house a number of shops with 'craft' type themes. You can jump inside the craft centre, and go out onto the virtual walk. Taken from Bow Street car park, on the left is the former Bolton Co-operative Society Building, a drapery store on Higher Bridge Street corner with St. George's Road built in 1904 with a striking terracotta decoration. Centre horizon is a mill. Right of centre is a former Wesleyan Methodist Church on St. George's street, built in 1803 but vacated in 1971, and now a casino. This shows the Market Hall. In the foreground, the River Croal goes underground until its reappearance near Queens Park. In the foreground was where the "Co Op" store mentioned above used to be. The Spire of St Paul's can be seen on the left horizon. This is a composite image from two photographs. On the left is part of the octagonal roof of the Octagon Theatre and behind that is the Museum and library building in the Crescent. 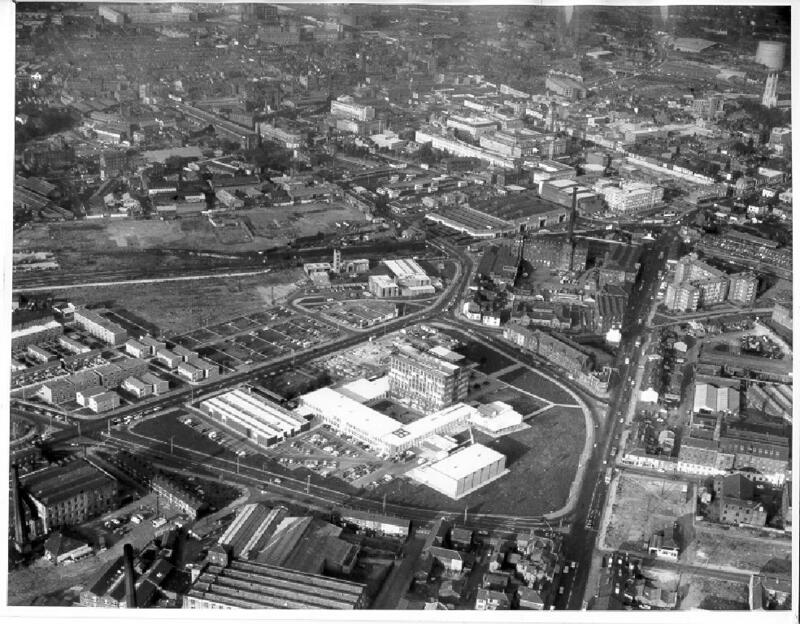 Left of centre is the Wellsprings, a recent development, also housing Oscar's bar. To the right of the clock tower, the horizon shows the line of the Pennines leading to the Peak District. Far right is the tower of St. Peter's in Churchgate. 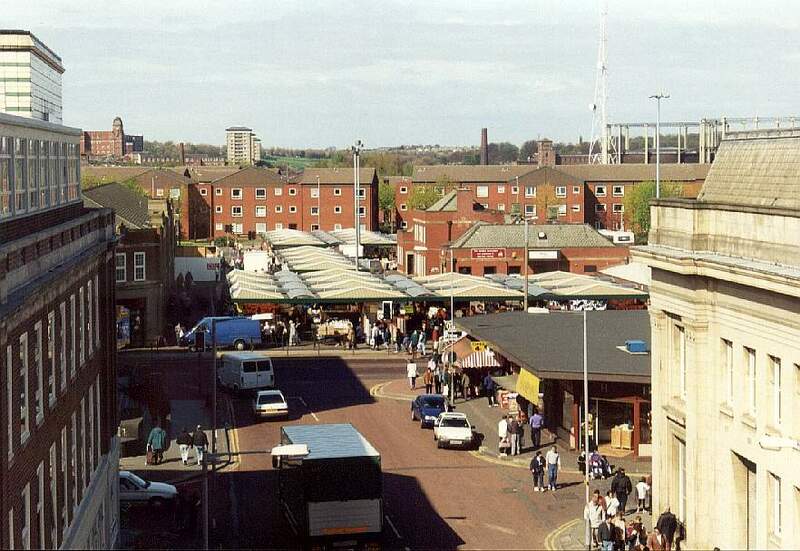 The relocated market in Ashburner Street. Looking south-east from the top of Smithills Moor, the highest point within the borough. Far right you can see the church and tower of St. Peter's, right of centre the clock tower of the town hall, and far right, Trinity Church. On the left far horizon are the Manchester and Salford cities. There is a similar night time view in the gallery. This is taken looking west from Watling Street, Affetside, South Turton. The road leading off centre is Derby Street, leading into St. Helen's Road. 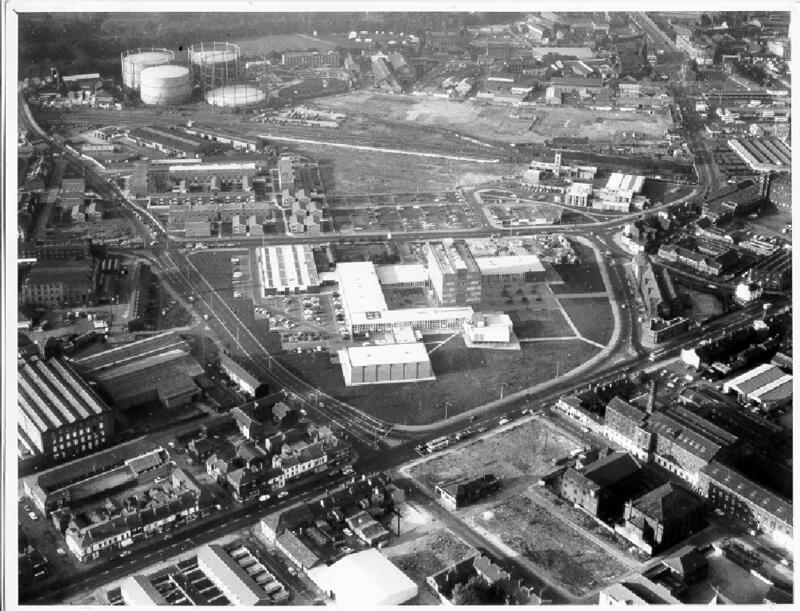 If you download the high resolution version, to the right of that road, you should be able to make out the clock tower of the town hall, behind that the tower block of Bolton Institute. 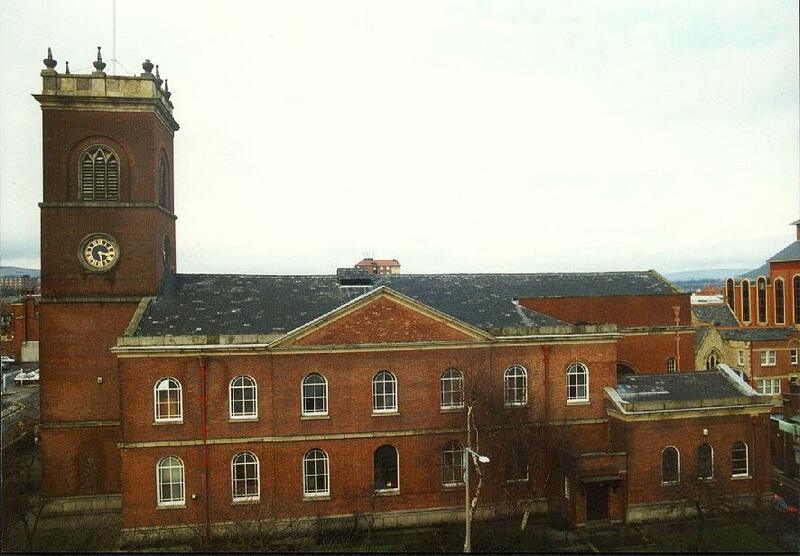 This picture will be included in the 'new' set of old pictures of Bolton Institute, centred. This view is a slightly different aspect to the one above.